with Derek Sivers, founder of CD Baby and owner of Wood Egg. Let’s just figure out the meaning of life, once and for all, in under 20 minutes, OK? 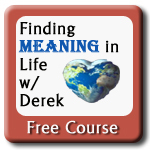 This short 20 minute program by Derek Sivers, founder of CD Baby is awesome. He does a great job of logically working his way through the problem of finding meaning in life and his conclusion is quite wonderfully humanistic. So if you want to know how a Humanist finds meaning in life – this is probably one of the best explanations of our thinking you can find.